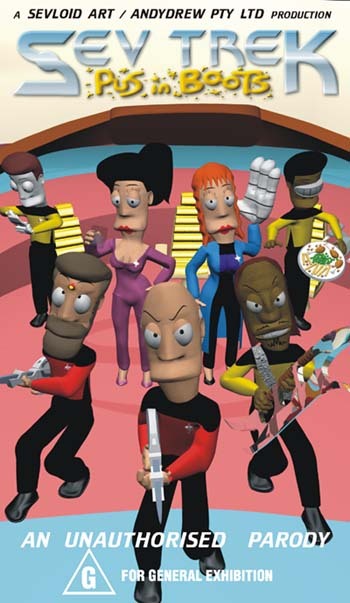 Written and directed by sci-fi parody cartoonist John Cook, Sev Trek: Pus in Boots features a computer animated feast for the eyes by animator Andrew Simpson, the amazing voice impersonations of comedian Wally Fields and a thrilling music score by Brazilian Marcos Kleine. There is also a music video clip by band BenHerd. The tape format is VHS Video in PAL-B format, playable in Australia and most of Europe. Other countries are recommended to order the NTSC version instead. Here is a page listing what type of tape each country can play.